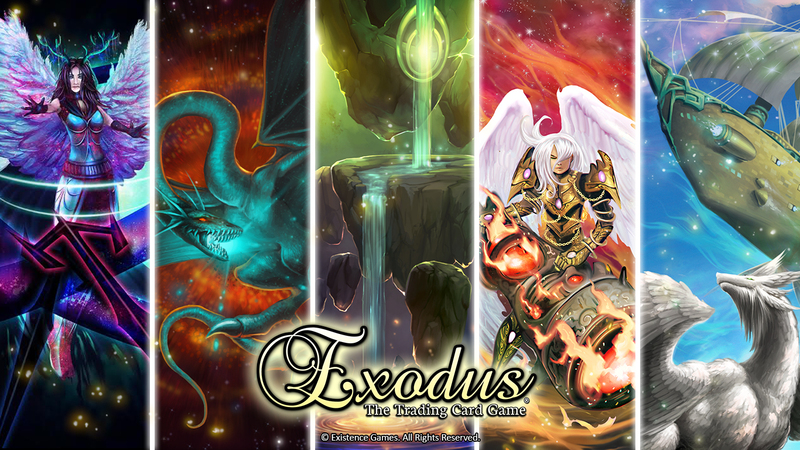 For signing up and being a part of our newsletter, we would like to give you a free Exodus TCG Wallpaper for your computer! There are currently two sizes available. Click on the links below to download the latest Exodus wallpaper, and thanks for reading! Happy New Year everyone! We hope everyone had a wonderful time during the holidays this season. 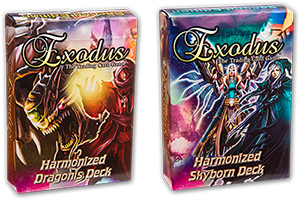 Get cozy and bring out those Exodus decks to enjoy with someone as you get warm by the fire or pour that next cup of hot chocolate. We’ve certainly been busy over here at Existence Games, even as our convention tour came to a close towards the end of the year. Our flurry of conventions ended with the awesome local ZappCon in Fresno, California. 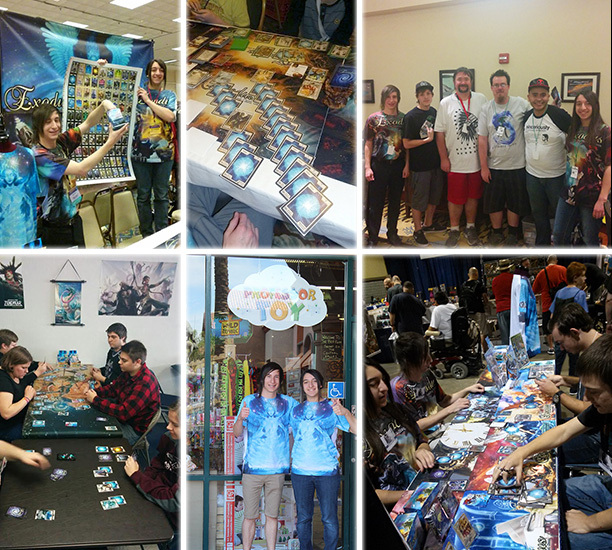 We had so much fun meeting local players and introducing Exodus The Trading Card Game to them. Every one of these cons was an incredible experience in 2015, and we were honored to share our game with so many of you. Now that the out-of-town trips are off the schedule for a while, we’re holding a series of tournaments and events at our local game store for all of you nearby players. We’ve already held some amazing tournaments in the last month or so, and we’ll continue to host these events; so it’s not too late join in if you haven’t already! Exodus constructed tournaments are always free to play in, as long as you have your own deck ready. 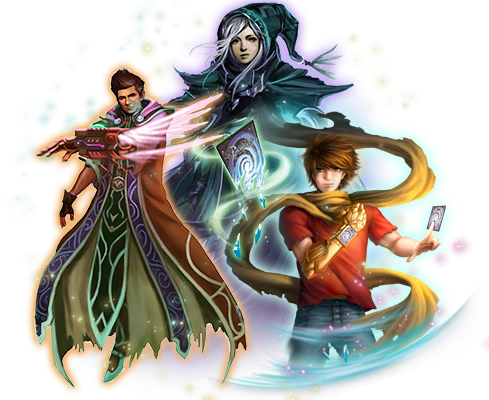 Players get a free promo card just by attending tournaments, which can be added to the deck, collected, or traded. Plus, it’s no secret that we love to spoil our players with prizes, as top 3 always gets a variety of oversized art cards, artist-signed cards, promos, and usually some sweet accessories. We also hold raffles for artist signed cards, so that players who didn’t make it to top 3 still get a chance to win. 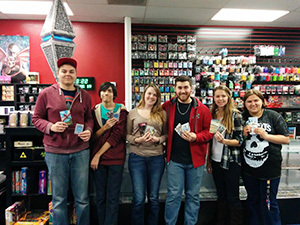 Our local tournaments and booster drafts are held at Blast Gaming in Clovis, California. If you’re interested in an upcoming event, keep an eye on our Facebook page, as we post tournament and draft information there ahead of time. Speaking of booster drafts, January is going to be an exciting time, and if you haven’t played in an Exodus event before, now especially is going to be the time to get in! 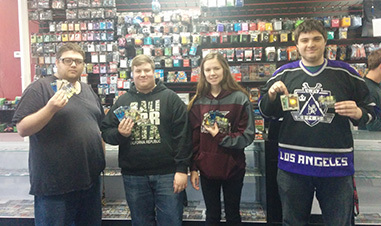 Saturday, January 2nd was the first booster draft qualifier. If you missed it, no worries—the next two drafts will be held on the 9th and 30th. Anyone who places top 4 in one of these qualifier events receives a personal invitation to play in our February studio Draft Championship in Fresno, CA. The entire event will be filmed live in the studio and will be uploaded to the Exodus Youtube channel. We’ll be interviewing the best draft players and shooting deck profiles during the championship. The grand prize winner will receive custom Drifter artwork in their likeness by an official Exodus artist! Exodus Life Counters are now available for purchase! These snazzy double-sided, full-art Counters are a great accessory and necessity to have while playing Exodus The Trading Card Game. They keep track of score for two players and go up to 15 Life Points, although the game normally starts at 10. (Could this possibly be foreshadowing Life Point gain in the upcoming expansion?) 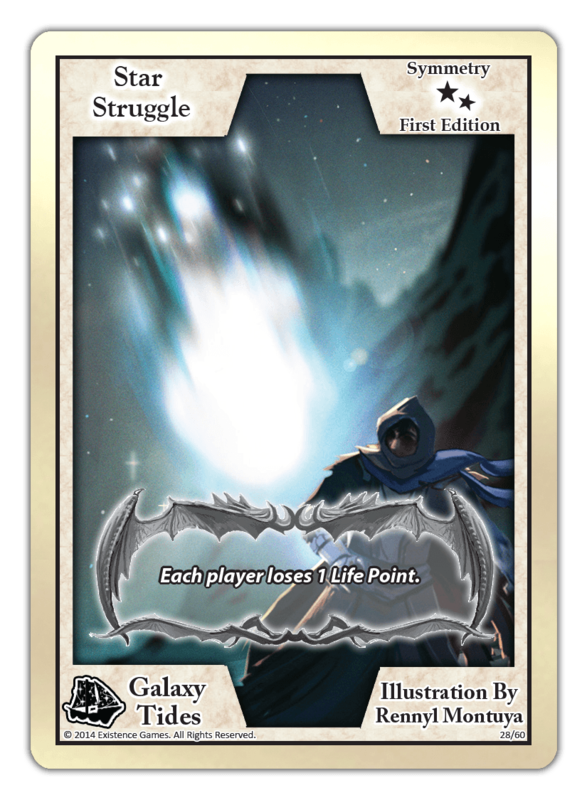 Life Counters are available through our online store as well as game stores across the nation that carry the Exodus TCG. Two new playmat designs have also been released: the awe-inspiring Alana mat from Galaxy Tides, and the epic Dimensional mat featuring the clash between our beloved Birth of Creation cover characters. Get yours today! Also available this month exclusively through our online store is our playmat Grab Bag! 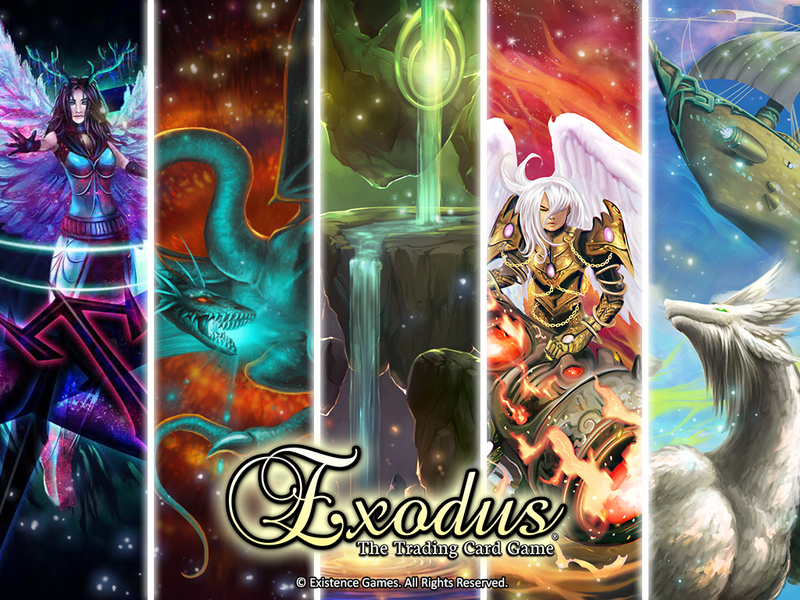 For $10 and free shipping, you’ll receive a randomly selected Exodus TCG Playmat. With 2 new playmats scheduled to be released each month, we will be phasing out older designs. Once a playmat design is sold-out, it will officially be out of print as we go on to printing new designs. There are several designs that we only have a few left of, so this is a great chance to get what will soon be a rare playmat from our first set of designs. Purchase multiple to automatically combine them into one package. As first glance, Star Struggle may not appear to be the most useful card. Since the card’s wording is “each player”, that indicates that you, along with all other opponents must lose a Life Point. It may not be the best timing to play this card if you’re losing (unless you’ve got one of those epic comeback strategies). However, if you’re winning at the time this card is played, you get to take a small slash at your opponent directly without even going into your attack phase. Of course, you lose a point as well, but even if your opponent uses Efil the Everlasting Empress, they still can’t catch up to you again. One way that most players are getting a kick out of Star Struggle is by waiting until they’ve gotten their opponent down to a few Life Points. When the opposing player is at only 1… Star Struggle! But be careful not to play this Symmetry if you and your opponent are both at one Life Point—unless you want a Draw that is. If you’re feeling the dier strategy, you could also play Star Struggle when you’re losing, or even better, when you’re at one Life Point! There’s plenty of amusing combos to make with this card, and tons more that will come in time. How do you like to utilize Star Struggle? Again we’d like to wish everyone a Happy New Year! Don’t forget to relax a little this winter season and have some fun. We’ll see you next newsletter!